Yay! The backyard is done! Well, part of it anyway. A huge thanks to my friends at Overstock for helping me with the mid century backyard of my dreams! I’ve always dreamed of having a long dining table in my backyard. I remember one time I went to Maisonry, a winery in Yountville. They had this long beautiful table in the backyard that people sat during their wine tastings and I could imagine myself doing the same in my own backyard. There weren’t very many mid-century patio furniture options up until recently. The one we opted for was the Amazonia Hawaii White 9-piece Rectangular Sidechair Patio Dining Set (another option here and here). 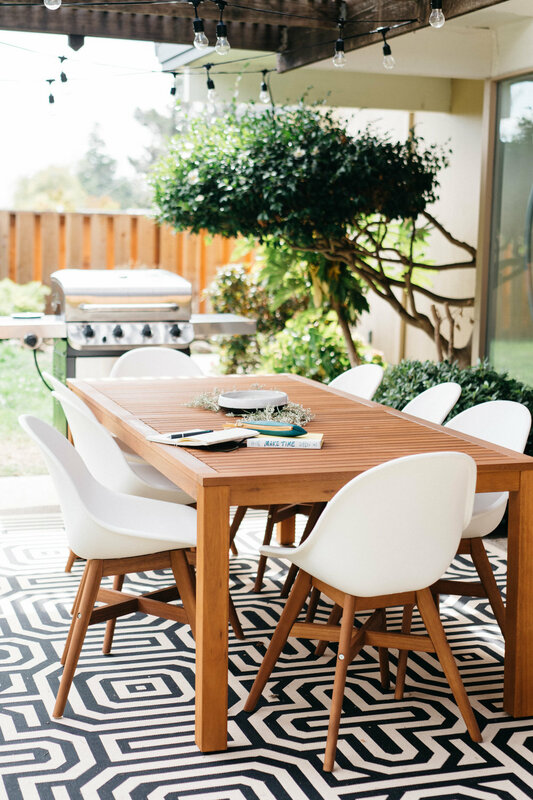 It was the perfect patio dining table to match the rest of HIGHWOODHAUS and any mid century home for that matter. My favorite element to this whole space is probably the indoor/outdoor rug by Safavieh. 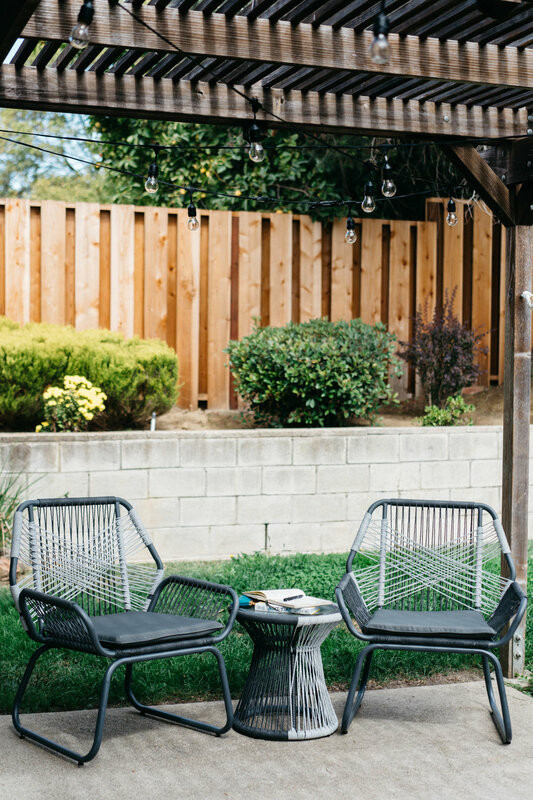 It helps ground the space and gives it this touch of fun liveliness to the backyard. Mackenzie Collier Interior Designs really helped influence a lot of these bolder patterns into the design of the house which traditionally I would’ve never been open to, but now I love it. Grilling food is by far my favorite way to cook. Before we got the Char-Broil Performance Series 3600 we owned this tiny little BBQ grill which made it so hard to grill for entertaining. Now we’re all set for cookouts with the family and our fellow Eichler neighbors. The Safavieh 19-inch Balboa Marble Indoor / Outdoor Garden Stool - White / Black is perfect for sitting or nesting food while we cook and serve. One thing you’ll notice when you come into our house is that there are plenty of places to come sit, have a messy conversation, and let your hair down. We love this Wicker Chat Set by Christopher Knight Home we chose for the backyard. At our house we love to celebrate people, life, and love. Maybe its our Filipino upbringing or maybe we just love food, champagne, and people. Either way, gatherings are a huge part of our lives. We needed plates and dinnerware that could support our love for gatherings. Year and Day, is an SF based company that embodies celebration all year round and they make the best ceramics that are simple, high quality, and timeless. They are also dishwasher safe and still look brand new after several months of using them. Well that’s our backyard space! 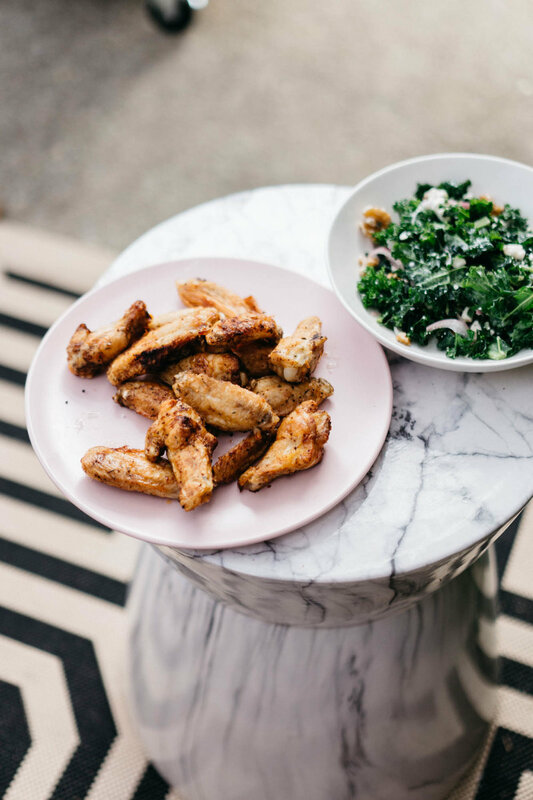 And even though it’s fall and winter’s coming, we love that in the Bay Area we’re welcoming Indian Summer season which gives us a few more weekends of hosting in our backyard. Who’s coming over? Many thanks to Overstock for providing us with the furniture to create our midcentury summer dreams.